​We offer first-time customers the opportunity to test all strings with this sweet ​INTRODUCTORY DEAL! We are a business specializing in high quality tennis strings. ​We pride ourselves offering the tennis community with truly innovative tennis strings at very affordable prices. Is this d​eal a scam? Tennis String Innovation: ​Our strings show top performances on and off the court​. Many of our strings have ​shown one of the highest tension stability lab test results (USRSA). ​On the court T1-Firewire, for example, has been ​rated ​#1 in the SPIN category on Stringforum for many years. This Package includes 6 Tier One Sports co-polyester string sets. This Package includes 6 Tier One Sports co-polyester + 1 high-end multifilament (TRIUMPH) string sets . ​​I always liked the quality of Tier One Sports strings but I think this is their best offering so far! I used to play national junior tournaments and now compete at high level adult tournaments. Control…check, durability….check, tension stability…check, playability….check! ​​Fell in love with these strings the first time I tried it. It has the most spin out of all the strings I've used with great ball pocketing and feel. So far I've found it best using it as a main string and using a smooth co-poly in the cross to maximize the spin. Tension maintenance is excellent for a co-poly. These strings has improved my overall game, I can generate tons of spin and my slices stays low. I've pretty much strung all my racquets with Firewire. Thanks Tier One, great product! ​​Finally had a chance to string up my Head Speed MP with a 16g T1 Firewire. WOW. Insane ball bite. Not sure if this is even legal. Although the string felt pretty firm I still was able to generate enough pop. Durability and tension stability was great as well. Will be my go-to string in the future! ​​I used to play Tier One Durafluxx for a while and was very satisfied. A friend of my introduced me to Black Knight and WOW. I am playing adult tournaments and consider myself a 5.5. Will be sticking with this string for a while! ​I tested Triumph side by side with Wilson NXT Tour because I was told that it plays similar to NXT. There is always a degree of doubt about the quality of a "no name" string. Stringing was easy like any multifilament string. Hitting the first few balls, the string had a very smooth, soft response. I was able to control the depth of my strokes nicely. Drop shots and volleys felt great. Very good feel. But the string did not lack in power either. I was able to hit my spots at the serve and had a few aces. Although the string lacked somewhat in spin (especially in comparison to the new generation polys), I was able to generate enough for my kick serve and ground strokes. Durability: The string started to fray at around hour 5 and broke at hour 6. ​I love this string! As a 5.0 player this string grips the ball and the recoil feels great. As a 46 year playing everyday I can only use it every other day due to arm inflammation. I use 17 gauge and a set lasts me a long time. ​Tour Status 17 is a black color co-poly, reminds me of a combination of Babolat RPM Blast and Genesis Typhoon. It has a nice firm response with a sweet grab/pocketing on impact. Playability and tension maintenance have been great for a $9/set string. ​This is a string that takes some adjustment. It has far more stretch in the stringing process than any co-poly I have seen, and required 5# additional tension than Wilson Revolve Plus or Tourna Black Seven. Very comfortable for a co-poly, you would think you put a multifilament or synthetic gut in the frame. Control is the long suit of this string, along with the expected spin potential of a co-poly. 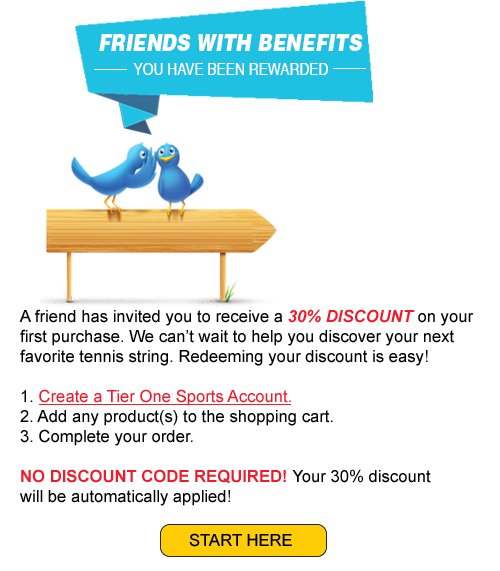 Why have I not heard about Tier One Sports? Up to this point we heavily relied on word of mouth recommendations from satisfied customers. Their positive reviews made us believe that other tennis enthusiasts would be happy to hear about our products as well. So we decided to start a marketing campaign to reach more tennis fans like you - and we are glad you finally found us! How good is the string quality? Receiving social approval online is hard to come by. Only true fans of a product are willing to LIKE products. T1-Firewire received more than 300 FB likes from our customers! All our strings have been lab tested by the United States Racquet Stringers Associations. The results speak for itself. Most of our strings show exceptional performance in tension stability and string stiffness. ​T1-Firewire, Black Knight and Ghost Wire, for example, showed one of the highest string tension ratings for polys in the industry. Ghost Wire and Black Knight ​were ranked as one of the best polys in the "low string stiffness" category! ​Click on your preferred string gauge. PLEASE NOTE: Triumph is only offered in 16 and 17 gauge. If you order the 17gauge package we will add Triumph in 16 gauge. If you order the 18 gauge package we will add Triumph in 17 gauge!